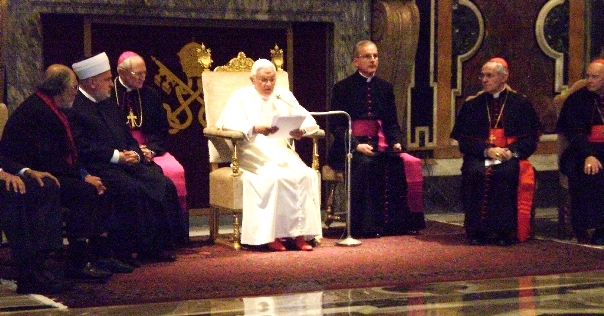 The participants of the First Seminar of the Catholic-Muslim Forum “Love toward God, love toward neighbour”, held in Rome from November 4, 2008 to November 6, 2008, had an audience with Pope Benedict XVI today. MINA transmits the address of Reisu-l-ulema Dr. Mustafa Ceric (who led the Muslim delegation) in audience with the Pope. Wassalatu wassalamu ala resulillahi we ikhwanih! It is my great pleasure to address you in the name of the Muslim delegation with sincere love toward God in-the-highest and toward neighbour, as our Common Word Between You and Us urges us in the interest of peace and justice in the world. Is the meaning of our times confrontation, or alliance, of civilizations? Your meeting with our delegation is not only a major step forward on the path of the Muslim-Catholic dialogue, but represents great hope for a better future for humanity. It is stated that Caliph Harun el-Rashid asked of a great Muslim scholar el-Shafia to speak of God’s Book, upon which he asked the Caliph: What Book of God’s are you asking me about, oh Leader of the Just, as God has authored a number of Books? In the spirit of such religious openness of the Islamic tradition Muslims value the message of the Second Council of Vatican in the declaration Nostra Aetate. That gives us the hope for a firm foundation of the Common Word Between You and Us in facing the many challenges of our times. In the Holy Qur’an it is said:- For the sake of times every man is at a loss, except for those who believe and do good deeds, who speak and advise others to say the truth, and those who are patient and recommend to others to be patient on the path of peace and justice (Qur’an, 103). In the Bible it is said:- Every thing has its era and everything under the skies has its time (Ecclesiastes 3:1-8). Therefore, this is the right question: What is the meaning of our times? Is the meaning of our times confrontation, or alliance, of civilizations? Is the meaning of our times violence or reconciliation? What are the fears of our times? What are the hopes? The fears are many. Our times have great sins, such as: riches without labour; enjoyment without awareness and conscience; education without nurturing; business without ethics; politics without principles; science without responsibility; trust without victim; religion without mercy. Yet, our hopes are numerous. Our times are the times of great possibilities: rich nations ought to share wealth with the poor peoples; people with sated stomachs ought to pay attention to the plight of the hungry; poor children ought to sense the joy of education and social success with their peers; the displaced ought to be able to return to their homes freely and without xenophobia and discrimination. Our times may be the best of all if we comprehend that right and justice are in the heart. As the drama of war and peace, the story of hate and love, the state of fear and hope - all of those are the phenomena of the human heart. We, the children of Adem (Adam) ought to repent before God in-the-highest for our sins as our father Adem did, humbly and devotedly, for the sake of new opportunities for the human life upon Earth. So, our times ought to be the times of healing of human wounds rather than killing human minds. ; our times ought to be the times of a civilization that binds in order to build and not to raze; our times ought to be the times of accepting one another in love toward God who created us all, and not to turn away from one another; our times ought to be the times of mutual love and not hatred, the times of peace and justice and not war; the times in which we shall not be silent, but we shall speak without fear, as Muslims and Christians, that the Holy Land must be the place of Holy Peace. Your Holiness, dear friends: I survived the four years of the siege of Sarajevo, at the end of the twentieth century. As it is known, genocide was committed upon the Muslims of Bosnia. I have come here to study a dova (prayer) for truth, justice and reconciliation in our mutual homeland of Europe. We shall not forget Your predecessor, Pope John Paul II who used to send this message:- You are not alone. We are with you in our prayers!. Nor failure to drive us to despair! Is the highest degree of power! Is the first sign of weakness! Enable us to willfully conquer defeat! Delight us with the blessing of faith! Gift us the strength of apology! Gift us with the strength to forgive! Do not forget us! Amen! Prof. Dr. Muhammad Sirajuddin Syamsuddin, President, Central Board of Muhammadiyah, Indonesia.